Enzymatic degradation of the extracellular matrix represents a key element in the multistage process of tumor invasion. Recently, a specific group of enzymes that are known as the matrix metalloproteinases (MMPs) or the matrixines family has shown to be involved in the degradation of extracellular matrix. Among the MMPs, the type IV colla-genases are the ones that showed the highest activity and among this class the MMP-2 is the one that has the highest collagenolytic activity and the best association with tumoral progression. The MMP-2 is secreted in humans by cells like fibroblasts, endothelial cells, keratinocytes, and macrophages. MMP-2 expression is increased in inflammatory processes as well as in malignant neoplasia. High MMP-2 levels have been frequently reported in cervical cancer (49,50). Moreover, MMP-2 expression increases gradually from cervical intraepithelial neoplasia (CIN I, II, and III) to cervical carcinoma (51). 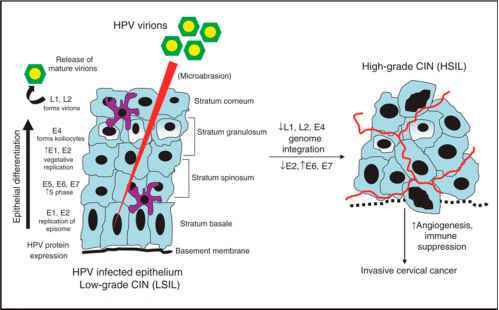 Recent studies have highlighted the key role of the membrane type I MMP-1 in cervical cancer. Specifically, MMP-1 expression is very low or absent in normal cervix and LSILs, is readily detectable in HSILs, and is very strongly expressed in nearly all invasive carcinomas (52). Moreover, genetic polymorphisms of MMP-1 are prognostic markers in patients with invasive cervical cancer (53).